You've probably already noticed that we've introduced some changes in the user comments section and we would take this opportunity to explain a bit more about the logic behind it all and hear your thoughts on it. Currently there are two commenting systems used throughout the site. The first one is used in articles by our team such as news and reviews. The second one is the system used for commenting the detailed phone specifications. The new changes to both systems are pretty much the same but there are also some differences. So let's take a closer look. A "Report" feature is added: We introduced the option to report a certain comment as one using foul or offending language - you can help GSMArena.com become a better and a cleaner place. However please use this feature responsibly, as abusing it will get you banned from the website. A "Reply" feature: Since having an improvised "Questions & Answers" session was rather uncomfortable with the old system, now you have the option to reply to some person's comment. There is no direct link between the original post and the replies, however each reply now automatically contains a quote from the original post and the poster's nickname. No Email field: There are no changes when posting a comment to news and review articles except that the optional Email field is now gone missing. We decided to remove it since most people didn't seem to realize that entering it will publish their email on the website. Publishing your email in the post body is not something that we endorse either. Choose your post type: Posting a comment to some phone specifications is the place where it gets more interesting. In an attempt to start a tagging/filtering system for the comments there we've added the new Comment Type field. Now Undefined is the field you should avoid using since it doesn't really help having a tons of comments with Undefined type. This was the way the old comments system was built. Choosing a more suiting type for you comment will help other users find a useful piece of information in the lengthy lists of comments more easily. If you just want to shout out "Nokia rules! ", then this is your category though. But bear in mind that comments like this one usually get deleted and repeated offenders get banned. We gladly accept your opinion about any brand if it's properly backed up by facts that you consider important. The Hands-on experience/review type should be your preferred choice if you are commenting a phone you've literally had in your hands. We would love to hear all the details you can share about the phones in our database. As long as you provide other users with LIVE impressions or insights about a handset, this is the type to pick. Comments such as "I've seen it, it looks all plastic." or "The battery life is rather poor in reality, but the display looks great under direct sunlight." sound like appropriate ones here. And remember, the more details you share, the useful the post is for everyone. 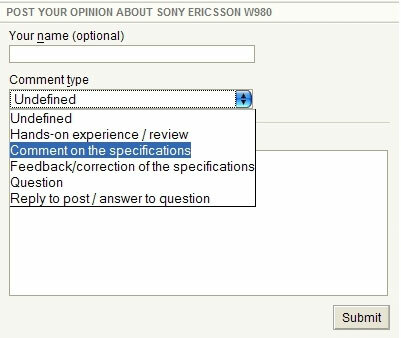 The Comment on the specifications type is the type to use when you just want to make a certain comment on some of the features of the handset in question. If you want to leave a comment such as "They should have put a better camera/battery", "FM transmitter sounds like a great feature" then this type is usually your best choice. If you happen to see an error in some phone's specs sheet, then please use the Feedback/correction of the specifications to report it. After all we are just humans and errors happen all the time. We'll take great care in going carefully through this type of comments - we really try to keep our cell phone database as accurate as possible and it's our daily task to check all sorts of signals about possible inaccuracies. If you feel like asking the other members of our community something about a handset then Question is definitely your right choice of type. Questions such as "How long does the battery last on this thing?" or "Will it play Crysis?" are spot on this category. And finally, if you think you know enough to answer other people's questions, please choose the Reply to post/answer to question type. This type is also preselected for you if you use the new Reply button in the comments list, but there's nothing wrong about answering a question with a Hands-on/Review type of comment too. So that's all. As you can see some of these changes such as the Post type are just paving the way for even more useful features such as a new sorting system for the comments. After all, we are a community and for this community to be beneficial to everyone we need a better way of communication. Tell us what you think in the comments - we really appreciate your feedback. Day after day, GSMArena give more familier for me.